Welcome to the Poison Oak Frequently Asked Questions page. If you have a question, I will add it to the list. See the bottom of the page for e-mail link. I am not an expert, merely someone stupid enough to get poison oak on several occasions. NOTE: I am including some submissions from people who e-mailed me. Some people prefer anonymity, so I didn't put any names. If you want credit for your submission, I will be more than happy to provide it. If I'm quoting from an e-mail you sent, or telling an anecdote you sent, and you want it taken down, I'll take it down. Can Poison Oak Be Spread By Scratching? Poison Oak can be a bush, vine, root, tree, whatever. My theory is that it is sentient and has a collective, malevolent, intelligence. I also believe it is capable of reaching out and grabbing one's ankles when hiking on a trail. The name poison oak is often applied to the shrub-like forms of poison ivy and to at least two similar plants that are usually considered separate species of the cashew family, Anacardiaceae. The poison oak of the southeastern United States, Rhus quercifolia, has its leaves divided into three leaflets; the leaflets are densely haired and generally have three to seven distinct lobes. The white, berry-like fruits are also somewhat hairy. The poison oak of the U.S. Pacific coast, R. diversiloba, is a shrubby or sometimes climbing plant that grows to 2.4 m (8 ft) high; its three-leaflet leaves are toothed or lobed and are hairless. Both species contain poisonous substances that are believed to be identical or closely related to that found in poison ivy. Poison Oak is usually not found above 4000 feet elevation (1219 metres). The Poison Oak rash is cause by a chemical called urushiol. This is present in poison oak leaves, branches, roots, everything. When you touch it, the oil is absorbed into the skin. This is a poisonous substance, and the rash is the result of your body's immune system fighting against this invader. You can get Poison Oak by touching the plant, its leaves, roots, whatever. If an animal, such as your dog, gets in Poison Oak you can get it from petting the dog (the dog won't get the rash though). You can get it from your clothing that touches Poison Oak. 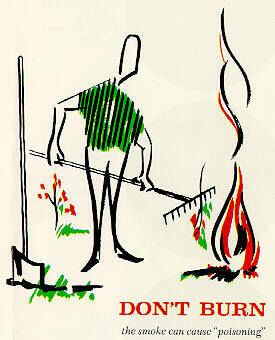 Whatever you do, don't burn it! The rash doesn't appear until after the oil is absorbed into your skin, because it is caused by your body's immune system. So the answer is no, once you get the rash, you can't spread it around by scratching. The oil that seeps from your wounded body isn't urushiol, its secreted by your body. The reason most people think it will spread is because of secondary infection. You touch a poison oak plant, the oil is on your hands. You rub your face, it gets there. The oil is spread. Now after a while, there isn't as much oil to spread around, so some parts get hit more heavily. What this means is, the rash appears soon is some spots, and takes a couple of days in other spots. This gives the illusion that you've spread the rash by scratching or whatever. Just make sure you aren't getting brand-new infection from your clothing. Whenever I go hiking, as soon as I get home I put all my clothes, shoes, everything in a bag, and wash it all. Only through extreme paranoia can you avoid poison oak. The alternative is to never go anywhere fun. Q: I think I've been exposed to Poison Oak, what should I do? A: If you are exposed, take a shower immediately, no matter how long it has been. First make sure all the clothes you wore, including shoes, are in a separate bag, and wash them before touching them again. Do not use hot water (see Anecdotes for more info). Submission: Soap does not help and may even spread the oil, says Dr. William Epstein, a poison-ivy expert at the University of California at San Francisco, who advises following the water with rubbing alcohol to pick up oil that might have soaked into the skin. Q: But once you've touched Poison Oak, how much time do you have to wash it off and not get the rash? A: It depends. Someone told me 10 minutes. Others say it can still reduce the exposure if you wash 2 hours later. The basic rule: always take a shower. Not only to (hopefully) reduce the chance of getting it bad, but to protect against secondary infection, i.e. getting it again off of your clothes or something you touched. Q: Which is worse, Poison Oak or Poison Ivy? A: I've had Poison Oak numerous times, but never Poison Ivy. My sources tell me Poison Oak is a bit worse. Q: Aren't Some People Immune? A: There are only two kinds of people: Those who get Poison Oak, and those who are going to get it. In other words, though there are those who are immune to Poison Oak, their immunity does wear off with repeated exposure. Contrary to popular belief, the more you are exposed to poison oak, the worse the rash gets. You can't become used to it or immune from repeated exposure, the exact opposite is true. Smoking or chewing will not make you immune! It will make you very sorry! Q: Weren't the American Indians immune to Poison Oak? Did they smoke it to develop an immunity? A: See this page for an updated answer, prompted by an e-mail I received. Original answer below. I don't actually know whether as a general rule they were immune. Immunity does wear off, so even if they were immune, they probably didn't just go bounding around in the stuff. Smoking Poison Oak does NOT develop immunity! Here's how I think this rumour got started: The Indians had been decimated by diseases brought from Europe, their land taken, and forced to live on tiny plots of land called reservations. One day, someone noticed that the Indians never got Poison Oak. This was because they weren't morons, they avoided it! But some white man asked the Indians, "Say, how come you people don't get Poison Oak?" And they though, "Stupid white man, take our land, will you?" So they said, "We smoked it! That's why!" And then big laughs as the moronic whites go kill themselves inhaling a noxious plant. Q: I have Poison Oak in my backyard, how do I get rid of it? A: Well, you're best bet is to just call a tree company. I know of a good one in the Bay Area, but they have too much business already, so I won't mention them. But there are Tree company's that come and chop down trees and spray oak trees and so forth. They may be able to get rid of Poison Oak. Q: I have Poison Oak! What do I do?! A: Well, you can suffer. That's about all you can do. Well, there are a few other things. If you don't do anything, you'll be totally miserable for about 2 weeks, maybe less, depending on how bad it is. Q: Does Calamine lotion help? A: Not really. It may help a bit for minor affliction, but is basically worthless. Hydrocortisone is pretty useless as well. Some poeople can find relief from these products. If you can, good luck. But if it is bad, what you want is Prednisone. See the next entry. Q: Should I go to the doctor? Atarax, or hydroxyzine if you buy generic, is supposed to make it itch less. It will make you very drowsy though. If your doctor does not know about these two medications get another doctor. Q: Does hot water help? A: There are different schools of thought on this subject. My opinion: Hot water makes it feel better only so long as you are running hot water over it. As soon as you stop it feels a whole lot worse. Other people find that hot water can help. Submission: Another way (Dr. Bob Sheppard of Carrollton, AL) has found relief (for poison ivy) is to hold the affected area under running, hot water. "For temporary relief, go to the faucet and turn the hot water on to the point where it is almost uncomfortable. Put the infected area in the running water," he said. "What you will notice is that the area will itch intensely," he added. "Continue to do this for a minute to a minute and a half, (and) finally, you'll begin to notice that the rash area is not itching anymore. And for four to five hours, you won't itch." Submission: I really enjoyed your information that you provided although I do dissagree with one of your no nos...which is the hot water trick that actually for some gives tremendous relief...what it does is allows all the histimine that is building up in your system to become released. Histimine is what causes the itch..itch...itch.It is only a temporary relief but it does last up to 8 hours or untill the histimine builds back up. Also you should tell everyone the shower should be a very COLD one at the time of infection to close the pores and wash off the poison oak. Some people find vinegar compresses or rubbing alcohol helps. I know at least one person who said it will feel better if you pee on it. Submission: P.S. Other medications that are used instead of prednisone are a Medrol Dosepak (medroxyprednisolone) or Decadron (dexamethasone). They are also corticosteriods. Instead of pills the Medrol or Decadron can be given as a shot. This is the route I prefer as I don't have to bother taking pills. I don't know much about poison oak, but I do know that Domboro soaks work good on poison ivy to dry it up. If poison oak is worse than these would probably work well on it as well. NOTE: This is from the wonderful pharmacist who corrected my spelling of prednisone (I was mixing up my 's' and 'z'). Thanks! Submission: I saw your web page and what I've been using as a treatment seems to be just about the best around. They're products by Tec Laboratories in Albany Oregon: tecnu and CalaGel. Note: I haven't had a chance to check out Tecnu's products yet, but when I do, maybe I'll post a review or something. Submission: The mugwort plant is said to have a soothing effect on Poison Oak and may possibly prevent an outbreak if applied quickly.often. Bruise the Mugword leaves and rub on the exposed area. Poison Oak and Mugwort often grow near each other. Submission: My docter gave me the predisone, which really helped and also suggested an over the counter gel. Rhuli gel, which helped relieve the itching. Submission: Aloe vera from the plant helps dry it locally. Problem with poison oak is that is gets into your blood and comes out in other areas of the body... Hot water aggrevates, bright sunlight irritates and sweating makes poison oak it feel worst. Mud packs help to draw the poison out of the skin. Rinse with cold water. Submission: I have just begun to produce homemade soap which I am making from jewelweed, nettle, comfrey leaves, plantain, burdock, and aloe vera extracts and tallow, lard , olive oil, and lye. It seems to be working as I go into the woods to gather jewelweed and nettle and have not got any poison ivy yet. I immediately bathe with my soap following my expeditions. Maybe I have found the cure! Submission: It helps if you pee on it. Because Poison Oak is one of the worst afflictions mankind must suffer, there must be rules of etiquette for dealing with it. You may not joke about it. You cannot say, "Don't you know what it looks like?" You may not offer your advice on how to treat it. You must show nothing but sympathy, and if it is feigned it must seem genuine. You are not allowed to intimate that the person who has Poison Oak deserved it, or is afflicted due to incompetence on their part. All the above rules apply to you. You may never boast of your immunity, and especially never touch poison oak to demonstrate your immunity. I heard of a man who ate a poison oak leaf to show off. This is a justifiable motive for homicide. If you cannot follow the above guidelines, please kill yourself now. You must show sympathy, and tell anecdotes about how bad you had it. You may joke and laugh, as long as you make it known that you feel very deep sorrow at the affliction. Feel free to imply that all immune people should be exterminated off the face of the earth. Subject: POISON OAK AS T.P. = BAAAD TIMES AHEAD!!! I Think the title speaks for itself... Carry toilet paper. Submission: See, I contract to the government, and one of the regular Fed employees here got into either poison ivy or oak. He's kind of dim upstairs, and so at the risk of him speaking to me on a regular basis for ever after, I suggested he see his doc because if you keep itching the stuff, it NEVER goes away... I didn't want to tell him that I find it disturbing that his open wounds weep all over the place, like on public transportation, and that he rubs his arms all over whoever's furniture he's sitting on. Call me needlessly paranoid, but I don't want to be near him at all. Well, I read your page and per your rules, can honestly sympathise with his situation (much as I dislike him) because one evening about a year ago, I pulled my husband behind a garage in the apartment complex and we stayed there for a looong time. Ahem. We were miserable for five weeks and I went to a doctor. So....you're right, it's just about the worst Mother Nature can throw at us in an idyllic wood, and Man, ANYONE has my sympathies, I don't care who they are. In case you think immunity doesn't wear off: What does the skin look like once afflicted? I USED to be an immune person...but, after hiking this past weekend, I have little blisters all over my arms and a big one on my leg...they look like 2nd degree burns, only the little ones itch...what do you think? When "Mike" was a lad, he and his cub scout troop went out into the boonies on a trip. They went up a mountain. They crawled down right through the bushes and brush, 90% of which were poison oak. When Mike got home, he took a nice hot bath. All the poison oak oil rose to the surface, and when he got up it coated him. As a result, he got poison oak on every inch of his body except the soles of the feet and the calloused parts of the hand. All his hair fell out, and he had to wear a bedsheet for the next six months while he recovered. "Clayton" went hiking with friends up a mountain. Though he knew the dangers of Poison Oak, he decided to stray off the trail. Why not, he thought. There is hardly any brush, just gravel and dirt. Of course, the further he and his friends went the denser it got. Gradually, oh, so gradually, but at the end of an hours time they were walking straight through very dense brush. Clayton got a major case of Poison Oak on his chest and arms; his friend "Robert" received an equally bad case. The third in the group was immune, but because he followed the correct etiquette he was allowed to live. "Regina" was hiking, and started to slide off a precipice. Reaching out frantically, she grabbed hold of a plant to keep from falling. It happened to be Poison Oak. It got in her bloodstream and showed up everywhere. Personally, I'd rather take my chances with the precipice.